Any dog lover knows that a vacation is just not the same if your dogs can't join in on the fun! For this reason, we are huge fans of bringing the dogs along whenever possible. Although it requires a bit of extra preparation, after many years and dozens of road trips, we like to think that we have become quite proficient at it! Behold, our list of 10 Essentials for Traveling with Dogs! Naturally, you will be bringing dog food along on your road trip. We recommend packing it in a lid locking container as opposed to keeping it in the standard food bag to prevent accidental spills or tears. Depending on where you will be staying these are also great for containing smells and not attracting unwanted animals! Just because you may be lax with the calorie counting on vacation doesn't mean that you should do the same for your pets! Consistency is key to maintaining a healthy weight and it is very important to measure your dog's meals. We use a collapsible measuring cup to save space! It is very important to remember to keep your dog hydrated on a long road trip. Set a reminder on your phone to make regular stops and provide fresh water. We recommend bringing along a collapsible water bowl for convenience and to save precious space in the car! When you gotta go, you gotta go right? You will likely be visiting rest stops, parks or even an open patch of grass to let the dogs do their business! Cleaning up after your dog is not only courteous but also good for the environment. We like to use biodegradable dog poop bags and keep them in a convenient carrying dispenser. pest repellent wipes can provide an extra layer of protection when visiting new places. We use an all natural option that takes advantage of the natural pest repellent properties of lemongrass, sesame and castor oils. When visiting unfamiliar places it is particularly important to keep your dog leashed. We like to pack a 30 foot training leash to give the dogs a little room to explore whenever possible. These leashes also function great as a tie-out if you are stopping for a picnic or rest on a hike and want to keep them close by. It is very likely that you will be doing at least a portion of the driving at night. Packing reflective gear for you and your dog is a great idea to ensure you can be seen when making pit stops or taking potty breaks along the way. Things can get a bit hectic on a road trip, so it is a great idea to have bars or snacks on hand that will provide sustaining energy. Make sure to keep in mind your dogs regular eating schedule, and if you are unable to feed at that time supplement as needed. These snacks are also great to use as an energy booster during long hikes. Be aware of your dog's daily activity level when determining whether or not these calories should be left out of their next meal. Many dogs see their crates a familiar and safe place. We recommend bringing along a lightweight, collapsible crate so that they will feel comfortable in their new environment. Last but not least, pack a small bag with some of your dog's favorite things. Pick things that bring comfort to your dog and can ease any stress or anxiety they may experience while traveling. We like to bring some of our favorite toys and a blanket! 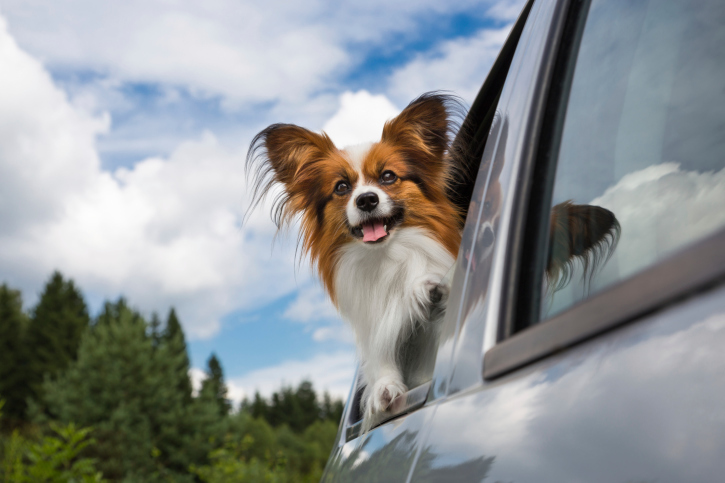 Traveling with dogs does not have to be stressful! 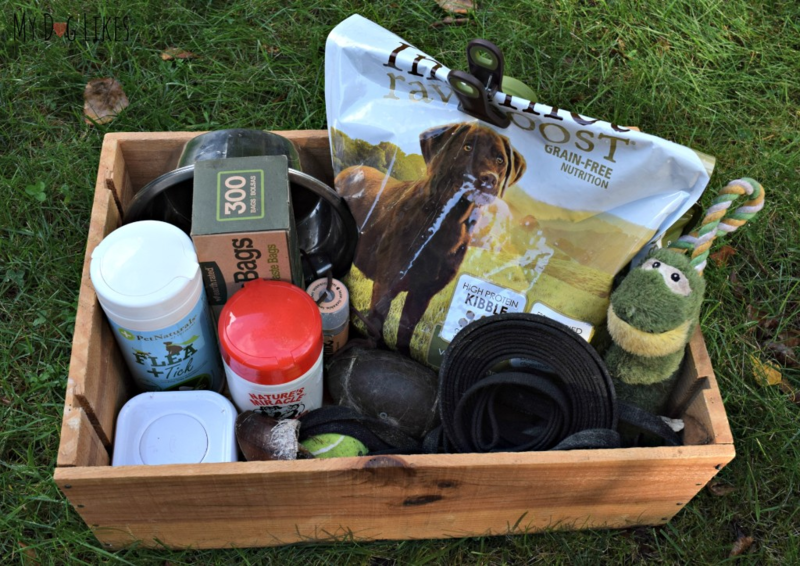 Knowing what to bring along, and a bit of preparation can make the experience enjoyable for you and your pets! Stay safe and happy travels! What else makes your list of travel essentials for dogs? Let us know in the comments below! If you and your dog like to lead adventurous lives, you might want to consider investing in one of our 4Knines seat covers for dogs. They make traveling a breeze and there are no limits to where you and your pup can travel. 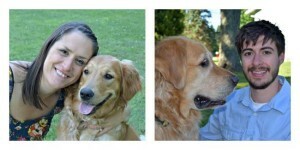 Kevin and Rachael Sando are the humans behind the site MyDogLikes.com. After years of trial and error and lots of frustrating purchases, they started MyDogLikes in order to share the best that the industry has to offer with pet parents all over the world. The real stars of the show are their Golden Retrievers, Harley and Charlie, also known as the Senior and Junior Product testers! Their site focuses on providing in-depth reviews for pet products, services, and destinations so pet parents can make healthy, fun, and informed decisions for their best fur-friend! !